Took a while for me to get this out, I will try my best to keep this interesting. The drive between Zion and Canyonlands is about 5 hours, which is a lot after a long day; hence the decision to stay in a middle point between the two parks made sense. We started the next day early and got onto Highway 70. It an plain long long road, just have to keep driving straight. Have a cup of coffee, relax and you would wonder how much calmness you can get just on the open road; I haven’t driven in many places, but one thing you cant miss as a fist time visitor in the area is the numerous road signs to pull over if you feel sleepy and there are pretty clear information on rest stops and distances. On either sides, there is nothing but just open land, and baby canyons, which may not look all red/orange right now, but has a tint of purple if you look closely. After several thousand geological years, these might be some of the future canyons. One can see the works of the winds, storms and rain on the mounds of sand. A famous landscape along the I-70 which was a kind of slanting 45 deg angle, and the road runs through these rocks. Later, I found that this is called the San Rafeal Swell area. It has about 8-10 vista points around this area, but we didn’t stop at any 😦 this time. 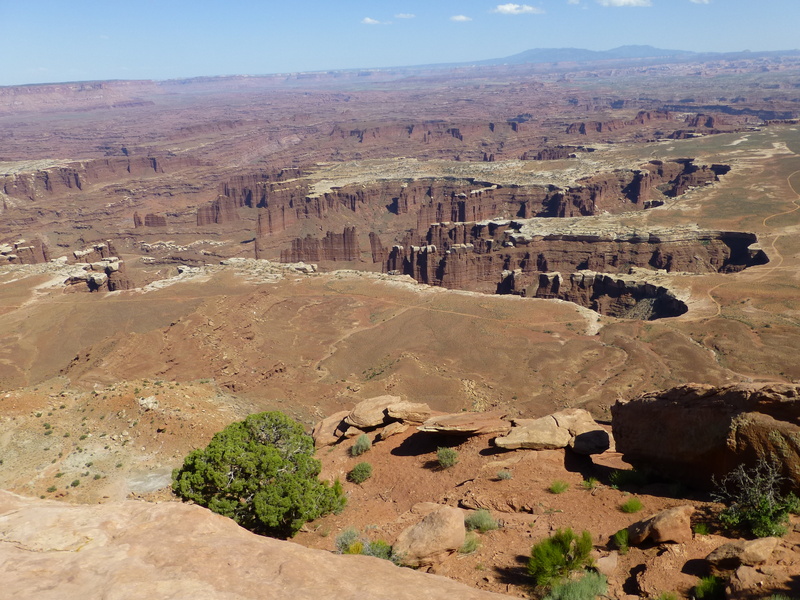 Once you get near to entering into Canyonlands, the park is situated about 25 miles inside from the main Highway 191, you wouldn’t have any clue of it from it, until you turn into Highway 131. There is a Shell gas station at the intersection, might help to fill up gas as there is no facilities inside the park. I had to trust the GPS and kept driving in hoping I would get the entrance and see a visitor center. This park is ‘b i g’, that it is divided into different districts, and the most commonly visited are the Island in the Sky and the Needles districts. Though these 2 districts of the park appear adjacent on the map, there are no roads inside the park connecting the 2 districts. You would have to get to Moab, and drive around to get to the Needles district entrance. This trip we spent only in the Island in the Sky district. 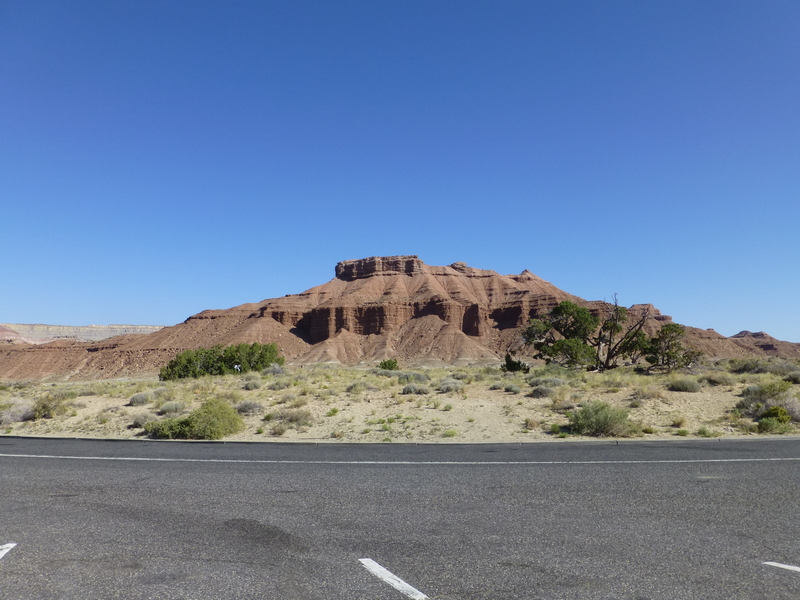 After picking up a map and filling our hydration pouches (as there is no water/food in the other points in the park), we turned back to get a sandwich from the ONLY cafe in Dead Horse point state park as recommended by the ranger. Then we were headed to Upheaval dome. 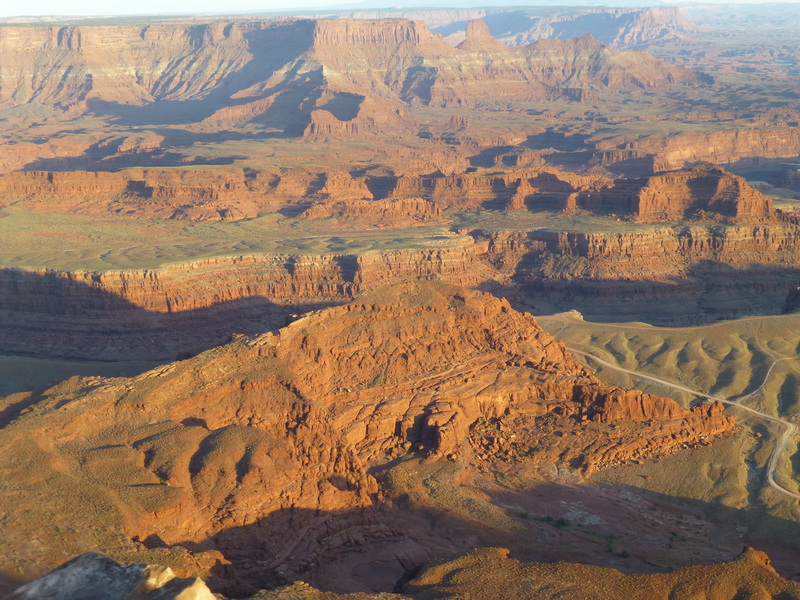 The ranger suggested to start from the Upheaval dome and work our way to the Mesa arch as that portion of the canyons provide some good views during the afternoon light. 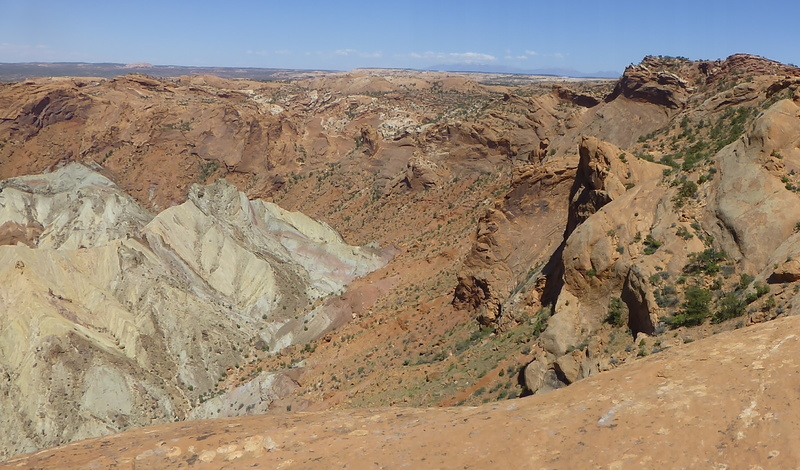 Reached the Upheaval Dome and hiked to both the vista points to see the remnants of the crater impact, which was about 1.5 miles approximately. The heat was too much and I was lazy to go to the second vista point, but made it anyways. 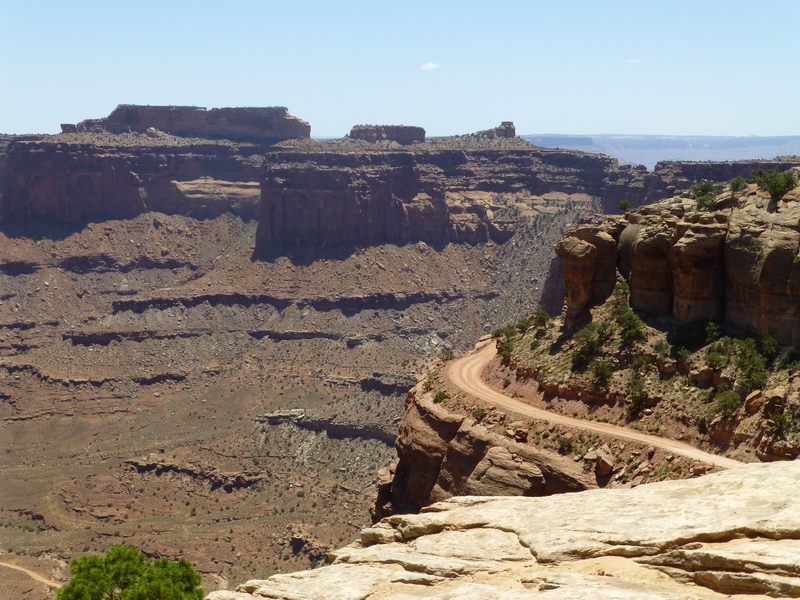 The next stop we made was Grand View point rim walk trail, which is about 2 mile hike along the rim of the canyon overlooking canyons. 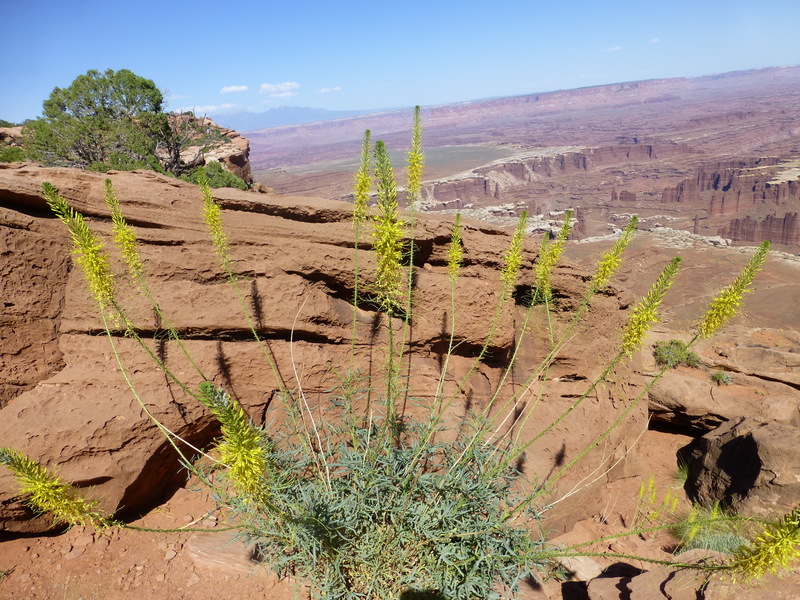 You can see a variety of colors in the canyon, some desert flora on the sides of the rocks. It was so colorful, I wish if there was some shade and it was not a hot day, I can just sit there gazing for hours. It was close to 5pm, we had Mesa Arch left to cover and decided to watch sunset at the Dead Horse Point State Park on our way out instead of staying in the Grand Rim overlook. 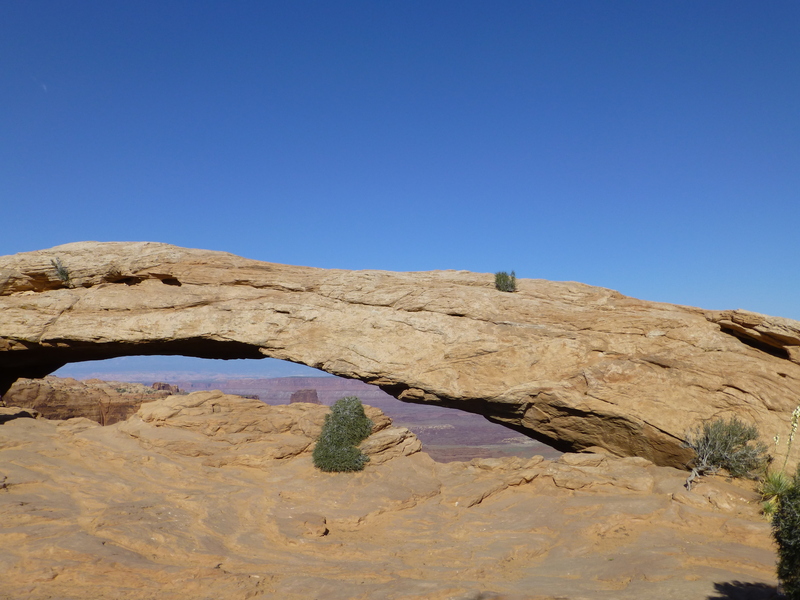 Mesa arch is an famous point in the Canyonlands, though the nearby Arches NP have several thousand arches. At sunrise, you can see a lot of passionate photographers gathered every morning, to capture this natural wonder. Sunset in Dead Horse Point was breathtaking, and by the time you drive out of the park, it was becoming pretty dark. Both of these parks have good opportunity for camping. We headed back to the hotel to get some rest. The plan is to spend the next day in Arches NP.